Representative Al Jacquet (D-West Palm Beach). House Bill 9 would force local governments to comply with otherwise voluntary requests from federal immigration officials. Sponsors named it the Rule of Law Adherence Act. But West Palm Beach Democratic Representative Al Jacquet says the measure might not pass constitutional muster. “Let’s talk about the rule of law. What we’re proposing to do today has already been determined to be against our constitution!” Jacquet said. A federal judge struck down portions of a similar law in Texas after cities sued. Jacquet's parents are from Haiti and he spent part of his childhood there. He spoke at length against the bill, speaking in both English and Haitian Creole. "Let's talk about the rule of law. What we're proposing to do today has already been determined to be against our constitution!" Hispanic lawmakers and community organizations vocally opposed the measure, as they have in past years. 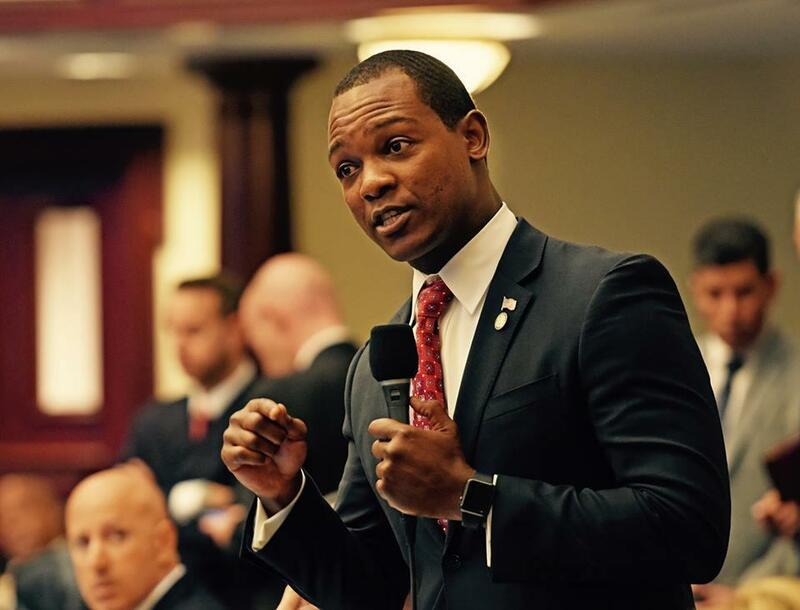 But after President Trump ridiculed immigrants from Haiti, El Salvador and African countries, Florida democrats railed against the bill which they say reflects Trump’s policies. And they accused Republicans of capitalizing on the conflict to fuel campaigns for higher office. Bill sponsor Larry Metz, a Groveland Republican, denies this. “Are we really trying to just serve up red meat in an election year? Or perhaps the bill is intended to help people to run for higher office? It’s just chest-thumping? I want you to know the genesis of this bill has nothing to do with that,” Metz said. Metz says he wrote the bill after an undocumented immigrant fatally shot a woman in San Francisco. But with an election year coming up fast, priorities and motivations will likely change for some lawmakers. Three House members are running for attorney general, and Speaker Richard Corcoran is expected to run for governor. He recently released a campaign-style ad outlining his support for House Bill 9. Meanwhile, the measure faces an uphill battle in the Senate: it hasn't had a single hearing yet.